Well, we have made it to the very last day of the mini book I started last month. I hope some of you have followed along and created your own right along side me. Today I am going to talk about page inserts. I usually leave these pages till the end so I can fill in gaps in the journal, cover bad sewing or brad legs as well give the journal a cohesive look. I find it easiest to just go page by page and see what the journal needs. Today I am going to show you how I started and then give you a page by page view of how the mini turned out. I covered 2 manila cards. One with music and another with a piece of ephemera. 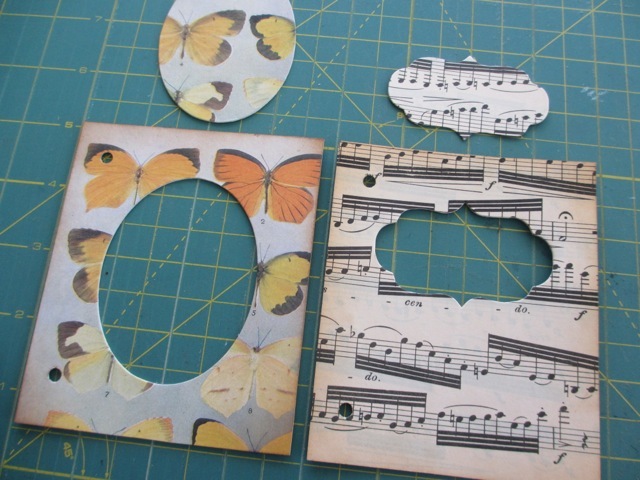 I used the Mini Labels set to cut a hole in the music card and the Sized Ovals to cut the butterfly card. I secured the Mover and Shaper die to the card with a piece of Tissue Tape so it would stay in place while I ran it through the Vagabond machine. I saved the centers so I could use those too. So here is the complete journal...well complete for now till I add the pictures and journaling. The journal is pretty darn fat already so I hope that part works out for me!! 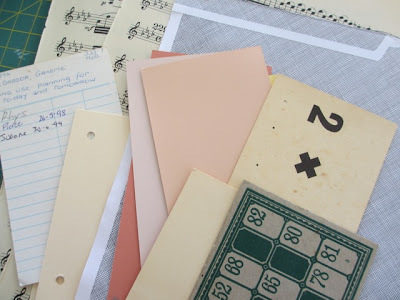 First insert: the music card. I added paper to the back and words from the Chit Chat sticker book. I also added the ruler paper from the Collage pad to the left side. 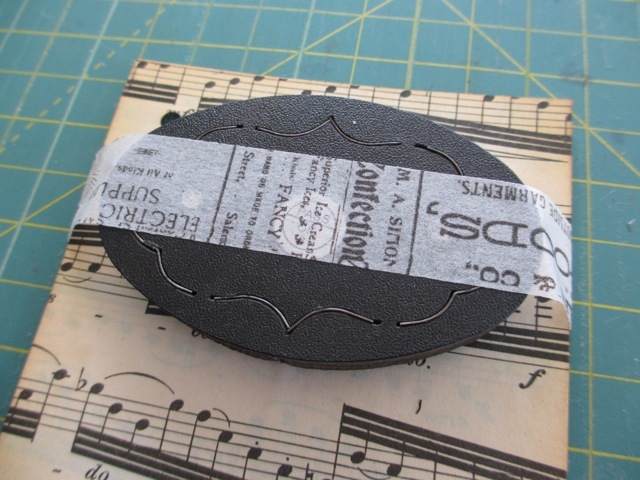 On the backside I added the oval cut out and a vintage flower held on with Tissue Tape: Elements. I cut a flash card and added it to the left side for a pocket. 1/4" Wonder Tape works perfect to hold it in place. In the pocket is a paint chip (thank you Martha Stewart) and a #5 tag stamped with the pointing finger blueprint stamp. One of my favorites! On the right, the library book card. You might notice a tab attached to it. I cut the leftover music piece in half to create two tabs. Vintage postcard + Chit Chat words. 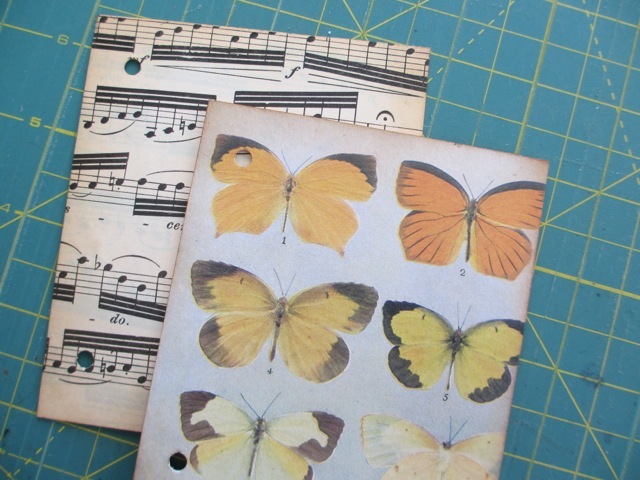 Butterfly card with a vintage word card glued to the back. The 3 punched circles from the recycled envelope sewn to a paint chip. Numbers from the Remnant Rubs sheet. I added music paper to the left side to cover up the stitching. Love how this one looks. 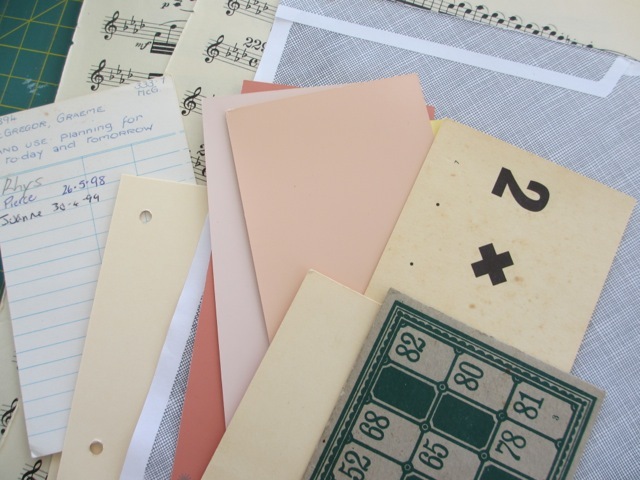 Lotto card and the second music tab. And the final page, the last paint chip. So that's it, the mini is done a ready for use. It will really come to life when I add the pictures and journaling. That part will take me a little while...gathering the photos I want to use and finding the right stories to tell. I have enjoyed walking you through the book and am hoping you will use the basics as a jumping off point to create something really special. This is so beautiful and already "screaming" to be filled up with memories! Have a good weekend, Paula! What a treasure you have created here! I just love the way you used bits and pieces from your life to make this artful journal. It's very special. Thanks for sharing the details with us. such a great album!!! Thanks for sharing! Beautiful little mini! Thanks for the tutorials. Fantastic job! Loved watching how you put it all together and I learned some great techniques! 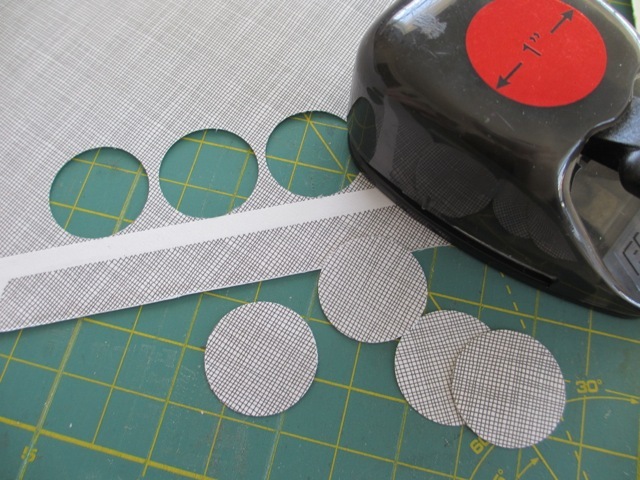 (I think my favorites were the grunge paper/foil die cuts...) Thanks for sharing! that are on every page. This is such a cute little book, if you can call it little. I love how you embellished it at the end.....now I want to make one to use up all those "things" I've been collecting. Thank you for taking the time to show us how your created it! Fantastic as always! YOu ALWAYS inspire me!! My husband is about to leave for 6 days - I can get started and just have fun! Yay! Thanks for this treasure trove of ideas, technicals, and inspirations. I've never made a journaling book so what a journey this will be! Thank you for all the work you did to show us how you made this "little" book. Although I haven't been able to start yet, I will be making one. My plan is to fill it with pictures and stories of visits from my granddaughter who lives in Arizona and give it to her. just a FAB post again Paula! Loved this.. I have been playing with this idea for some time.. maybe this post is the push that I need.. Thanks for sharing! Metallic Distress Paint - can't. get. enough.